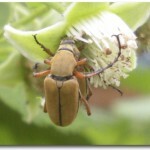 Synopsis: As we move further into summer the beetle complex, most importantly the Japanese Beetle Popillia japonica, (JB), will begin feeding on the foliage of tree fruit and grape. 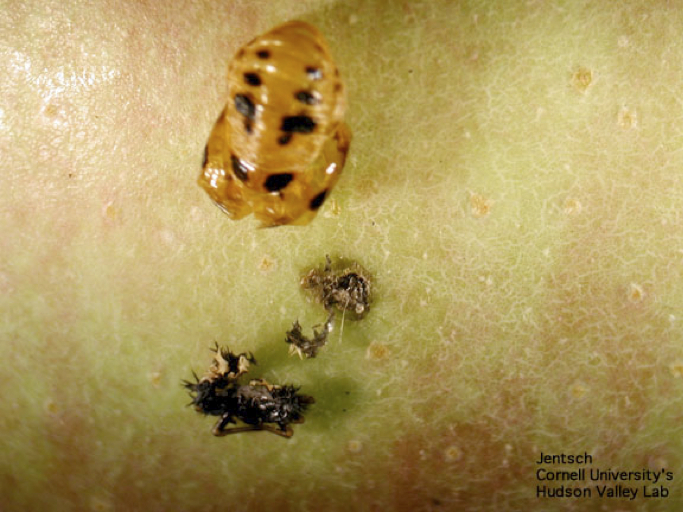 Targeting applications for JB shortly after the first sign of emergence, which has occurred over the past 7-10 days in the Hudson Valley, will optimize management of the insect. This is especially important in newly planted trees and vines where establishment and growth is critical. 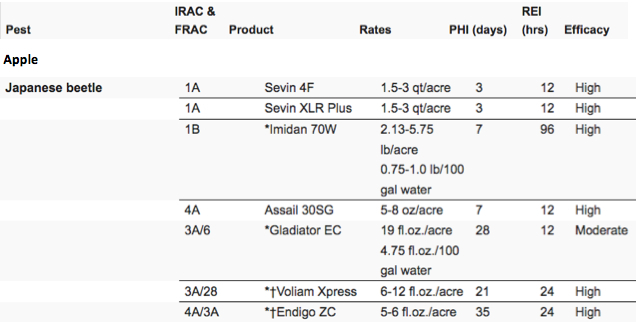 Management tools include Carbaryl /Sevin (Carbamate), Imidan 70WP (OP), Assail (Neonicotinoid) and pyrethroid pre-mixes. 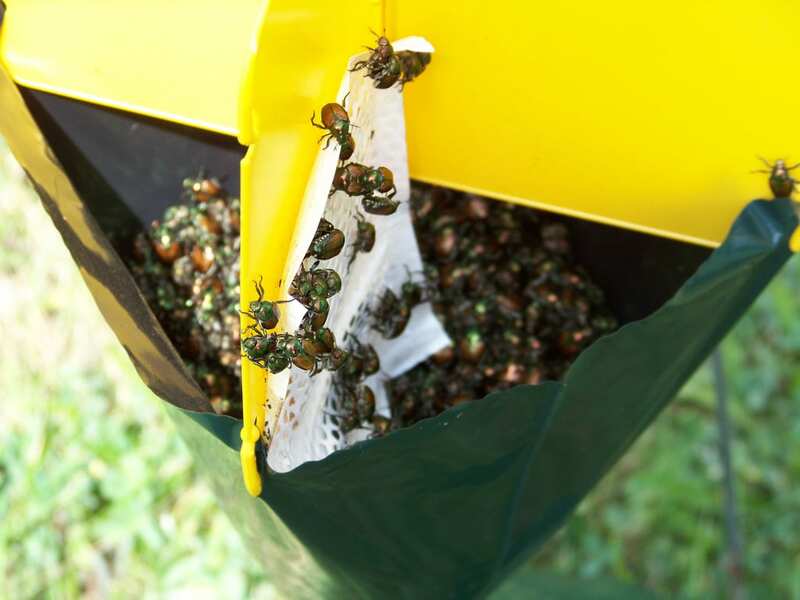 Be aware that the use of the Japanese beetle ‘bag traps’ employ pheromone and floral scent, very effective in luring JB into the vicinity. Yet when placed in your field the shear numbers of beetles moving to your crop can causing greater damage to your foliage and fruit. If they are used, place the bags a considerable distance away from your orchard or vineyard so as to reduce the population in your crop. They will fill quickly and need to be emptied frequently. Introduction: The beetle complex moving through Hudson Valley commercial orchards this season will include the multicolored Asian ladybird beetle (MALB), the rose chafer (RC), Japanese beetle (JB), and occasional fruit feeding adult plum curculio (PC) during the summer. During the past few days we have seen increased feeding of tree fruit and grape foliage from members of this group, especially to new succulent foliage on growing terminals. In newly planted trees and vines this reduction of leaf tissue may lead to reduced carbohydrate production and storage, resulting in decreased establishment and overwintering success. Japanese beetle: Over the years we’ve observed the first emergence of Japanese beetle, Popillia japonica, during the first week in July. However the emergence has been lack luster in many sites over the past few years compared to previous growing seasons. 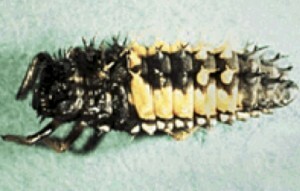 High numbers of this insect can cause significant leaf loss, especially in newly planted blocks in which terminal growth is essential for establishment. As the name suggests, the Japanese beetle is a non-native beetle, indigenous to Japan. The first sighting of this beetle occurring in the United States in 1916 from a nursery near Riverton, New Jersey. It is thought that beetle larvae entered the United States in a shipment of iris bulbs entering the country, prior to the onset of commodity port of entry inspections. The adult beetle is 0.6 inches long and 0.4 inches wide, with iridescent copper-colored elytra and green thorax and head. Females will mate shortly after they emerge from the soil only to burrow back into the sod to lay eggs, repeating this cycle through the early part of the summer. 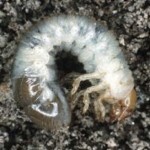 The larva or grub is cream colored and feed on roots of grasses for most of their immature life. The damage they inflict often causing high mortality to grasses in agricultural, lawn and golf course turf. 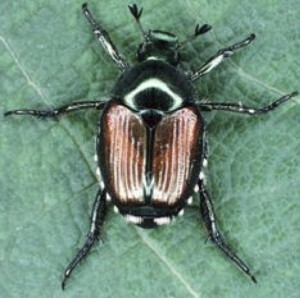 Japanese beetle are attractive to a ‘congregation pheromone’. This lure has been synthesized and is used in traps baited with both floral scent and pheromone. However, studies done at the University of Kentucky suggest that traps attract more beetles than they actually trap, thus causing more damage than may have occurred were the trap not used. The Japanese beetle is a serious pest of about 300 species of plants throughout the eastern US, and considered the most devastating pest of urban landscape plants in the eastern United States. It feeds on apple, grape, rose and a wide variety of other trees, shrubs and weed species. Damage to plants by adult feeding results n the skeletonizing of the leaf, consuming foliage between the leaf veins. It will also feed on ripening or damaged fruit, especially to early peach and apple varieties as ripening occurs shortly after Japanese beetle emergence. Managing the beetle on ripening fruit is often difficult due to pre-harvest interval limitations of effective materials. Multi-coloured Asian lady beetle: When an abundance of the aphid complex colonies begin to appear on apple we often begin seeing the multi-coloured Asian lady beetle adult, Harmonia axyridis (Pallas) (MALB), moving into Hudson Valley orchards. Populations of this predatory insect can build to very high numbers, most often for our benefit. As this beetle is beneficial, we aim to conserve the nymphs and adults as a biological control agent that has the capability of consuming 20-60 aphids per day respectively. However, if cool wet weather provides aphid populations with ideal conditions for growth, they may move from feeding on foliage to fruit. On occasion we have observed MALB nymphs follow the aphid complex over to the apple to continue their predatory activities. Yet as the larvae near maturity to emerge as adults they will often pupate directly onto fruit. They do this by ‘gluing’ their mouthparts onto the surface of the fruit, leaving a shallow hole or blemish in the surface of the apple. If aphids continue to be problematic, low rates on the neonicotinoid products (Provado, Assail or Calypso) will lower the aphid population while maintaining biological control agents such as the MALB, the orange cecidomyiid and cream-colored syrphid fly larvae to co-exist with the aphid complex, continuing to reduce aphid numbers while reducing the potential for fruit injury from the pupal stage of MALB. The Rose Chafer: Macrodactylus subspinosus (Fabricius), is a tan colored, long-legged and slender beetle from 8-12 mm long. The rose chafers damage plants by feeding on the flowers, newly set fruit and foliage. On roses it skeletonizes the leaves in the same way that other scarab beetles, like the Japanese beetle, do. It prefers breeding sites with sandy soils where populations will reach economic damage levels of both foliar and fruit feeding. Northern NY fruit growing regions appear to have high seasonal populations. June beetle: May beetle, June bug or June beetle is a widely distributed beetle and diverse group of plant-feeding beetles in the genus Phyllophaga, belonging to the family Scarabaeidae. These redish-brown beetles commonly appear in the Northeast during warm spring early summer evenings and mostly noticed in the evenings attracted to lights. 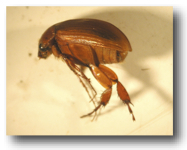 June beetles vary from 12 to 25 mm (0.5 to 1 inch) and have light brown wing covers (elytra). They feed on foliage at night and if they are present you would likely see them while making early evening applications. Carbaryl or Sevin is formulated as a liquid XLR Plus, 4F or 80S powder. 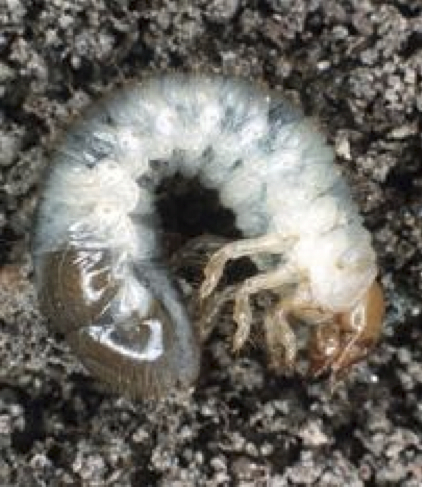 Carbaryl is highly effective in codling moth, adult and nymph leafhopper and Japanese beetle control during the summer. Assail 30SG (EPA Reg. No. 8033-36-4581) is registered for use in pome fruit and grapes in NY. 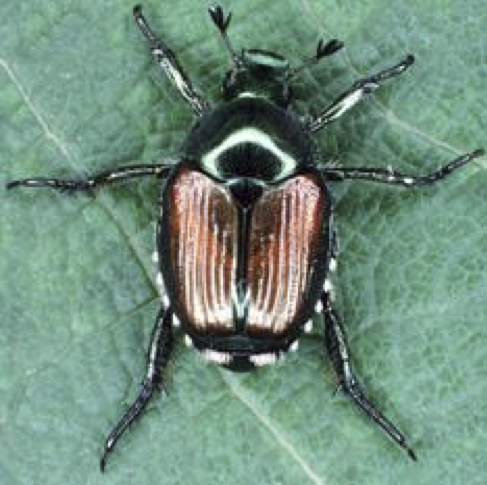 Along with control of CM, OFM, apple maggot, aphids, and leafhoppers, it has been noted that Assail applied at early infestation of Japanese beetle causes the beetles to stop feeding and eventually kills the adults. Assail recently received a federal label for use in stone fruits, not yet approved in NY for stone fruit. Leverage 2.7SE should be reserved for those situations when the pest complex to be treated is appropriately matched to the combination of active ingredients and modes of action contained in the product. Not labeled for JB on apple. Actara* labeled for use against JB under a Section 2(ee) for supression of JB on apple only. Rose chafer feeding on berry flowers.